Global and regional institutions with a responsibility to guard press freedom are largely failing to fulfill their mandate as journalists worldwide continue to face threats, imprisonment, intimidation, and killings, according to Attacks on the Press, a yearly survey released today by the Committee to Protect Journalists. 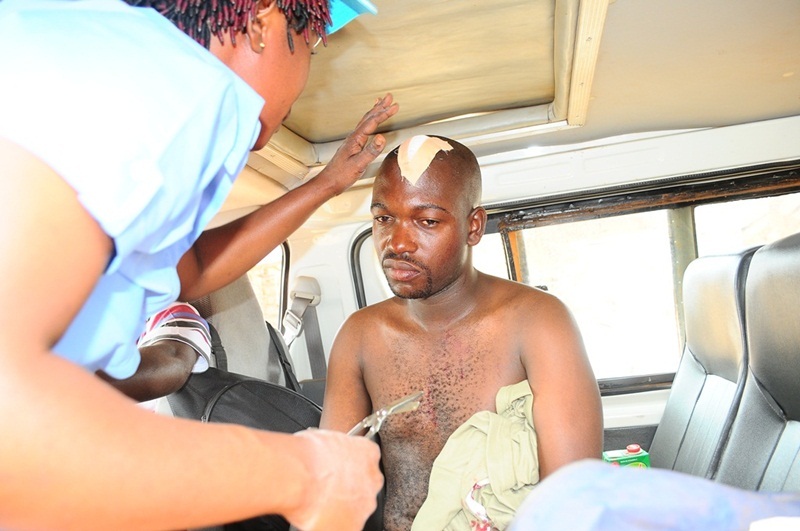 Michael Kakumirizi,a photojournalist with Red Pepper gets dressed up after sustaining a cut on the head when a fight broke between FDC and NRM supporters in Aloi Subcounty, Aleptong district. Attacks on the Press is the world’s most comprehensive guide to international press freedom, with thorough analyses of the key factors that obstruct a free press by CPJ’s regional experts. It includes a special feature on the invisible nature of online attacks meant to curb journalists, including online surveillance, malicious software, and the elimination of news sites from the Internet. CPJ found that a halfhearted, inconsistent approach to defending press freedom plagues institutions like the United Nations, the African Union, the Organization of American States, and the Organization for Security and Cooperation in Europe, among others. “While valiant special rapporteurs at various institutions battle anti-media violence, their efforts are stymied by a halting political will to guarantee press freedom,” said Simon. A rise in investigative journalism has led governments in the region to crack down on journalists, particularly those reporting on the provision of basic services and the use of public money. From Cameroon to South Africa, authorities are moving aggressively to unmask confidential news sources, criminalize possession of government documents, and retaliate against probing journalists—all while governments across the continent, under pressure from donor countries, are pledging more transparency and accountability. Decades since democratization took hold in the region, a rise in censorship can be seen throughout Latin America, caused by government repression, judicial interference, and intimidation from criminal groups. In some countries, a climate of impunity perpetuates a cycle of violence and self-censorship. In others, governments abuse state resources to silence critical reporting, and powerful figures routinely utilize politicized courts to override constitutional guarantees of free expression. With a mixture of violence and official repression, censorship in Asia takes many forms. China’s anti-media policies are becoming ever more entrenched, even as local journalists test the daily guidelines flowing from the Central Propaganda Department. Asian democracies like Thailand, the Philippines, and Indonesia appear incapable of reversing the impunity with which journalists are being killed, while Sri Lanka’s peace dividend never materialized for journalists. Pakistan was the world’s deadliest country for journalists in 2010. Newer and subtler forms of censorship are taking hold across the region to counter the rise of electronic journalism, particularly in Russia and the former Soviet republics. These include the targeted use of technological attacks and the untraceable disabling of independent media websites. The physical violence already employed in several countries to harass and intimidate journalists working in traditional media now extends to bloggers. Meanwhile, journalists face restrictions and potential punishment from defamation laws and anti-extremism statutes. Throughout the region, governments are conflating critical coverage of counterterrorism with terrorism itself, claiming national security grounds to suppress news and views considered unfavorable. From Egypt to Turkey, sweeping national security legislation has been enacted, criminalizing the coverage of terrorism and politically sensitive topics. Iran leads the region in its abuse of anti-state charges, and from Sudan to Bahrain, authorities resort to threats, harassment, and restriction of movement to limit coverage and conceal controversial activities and flawed policies.